Library image #3501: Looking across Hidden Lake from Hidden Lake Peaks, to Forbidden Peak (left) and Boston Peak (right). The United States Congress designated the Stephen Mather Wilderness (map) in 1988 and it now has a total of 638,173 acres. 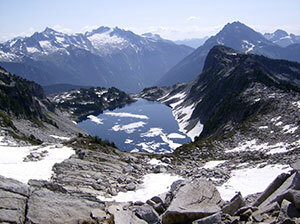 All of this wilderness is located in Washington and is managed by the National Park Service. The Stephen Mather Wilderness is bordered by the Pasayten Wilderness to the northeast, the Mount Baker Wilderness to the northwest, the Noisy-Diobsud Wilderness to the west, the Glacier Peak Wilderness to the southwest, and the Lake Chelan-Sawtooth Wilderness to the southeast. If you're looking for sheer wildness and first-rate alpine climbing, this area may be your best choice in the Lower 48. The North Cascades National Park "Complex" consists of three units: North Cascades National Park; Ross Lake National Recreation Area, a slim piece of land just east of the park; and the Lake Chelan National Recreation Area, at the southeast corner of the park. These three components are combined into the Stephen Mather Wilderness, a huge and tremendously rugged piece of earth with jagged glaciated peaks above narrow stream drainages and densely forested U-shaped valleys. The Pacific Crest Trail crosses the southeastern corner of the area for about 13 miles, but most of the trails tend to be long and crudely rambling. Maps show about 390 miles of pathways, but if trail access determines what you see, you'll see little of this Wilderness. Reaching huge sections of the area can entail multiday hikes, often combined with mountaineering, through remote, trail-less territory. A Wilderness experience of the highest order awaits the prepared. Planning to Visit the Stephen Mather Wilderness? How to follow the seven standard Leave No Trace principles differs in different parts of the country (desert vs. Rocky Mountains). Click on any of the principles listed below to learn more about how they apply in the Stephen Mather Wilderness.